I bought a small 60 year old townhouse a little over a year ago. Needless to say, it is a fixer upper. Todd and I have been busy working on the house in preparation of him moving in. This past weekend, we had some of our amazing friends come over to help do some renovation projects. I am so proud of our accomplishments that I just HAVE to share them with you all. The kitchen was usable but nasty. First off, the walls are a blinding yellow. 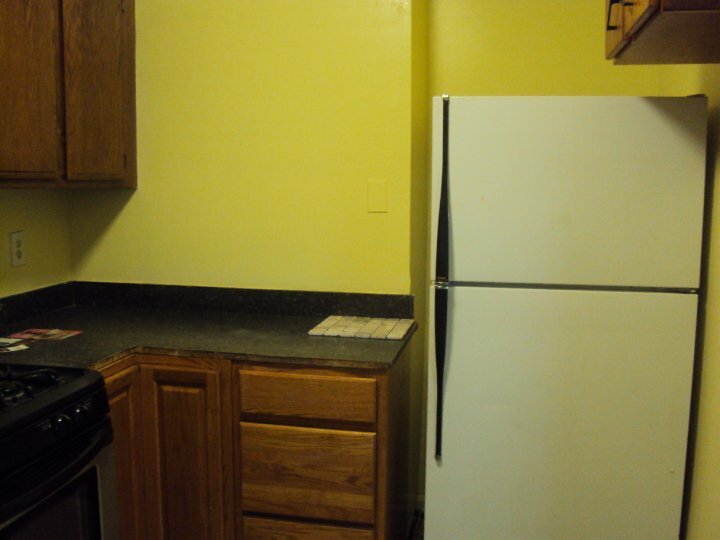 The top cabinets are probably original to the house or at least really, really old and not properly maintained. They kept disintegrating when I touched them! 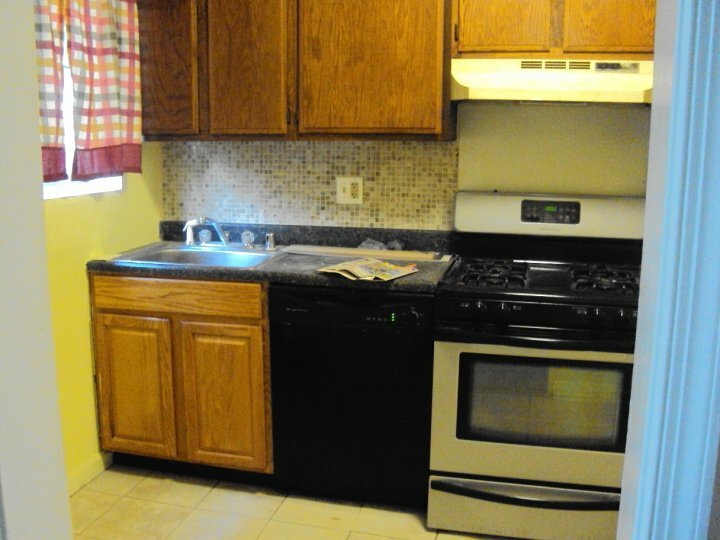 The bottom cabinets are in much better condition, being obviously newer. The laminate countertops have torn and unfinished edges. The tile backsplash over the sink looks nice on first glance but upon further inspection it is not properly grouted or installed. The window treatments came with the house and smelled disgusting. As for the appliances, the exhaust hood was covered in brown, sticky grease. Otherwise, everything seems to work pretty decently for now. As you can see, we made quite the improvement this past weekend! (Please disregard the clutter!) Obviously, there is still a lot of work to be done. Todd and some of the guys took down the old top cabinets. I was hoping for a smooth demolition where all they would have to do was undo a few screws... Ah, wishful thinking. The cabinets were both screwed and nailed to the wall... and to each other! It was crazy trying to get them apart and down from the wall. It took about two hours to get a measly four cabinets off the wall. Not to mention all the dead bugs that fell down with the cabinets! It was absolutely disgusting. The bugs that did not fall off with the cabinets stuck to the walls. I would have taken a picture but my camera battery was dead. A couple months ago, I had purchased "new" upper cabinets off Craigslist for $60! I had sanded and painted the insides and outsides during spring break. They have been sitting around my dining room and kitchen since then. Putting them up took a little thought but I think it was smooth sailing compared to the demolition. Todd and I could not have put the new cabinets up without the help of our friend Ben. While the guys were doing the cabinets, the girls were painting. Rachel did a fabulous job of sanding and priming the cabinet doors the Craigslist and the existing lower cabinet doors. We used Valspar primer (one coat) and Olympic semi-gloss in Ultra White (two coats). The weather happened to be gorgeous for October (in the seventies!) so we were able to paint outside. After everyone left, Todd and Fontaine sanded the bottom cabinets. After they left, I finished priming and painting the cabinet doors and lower cabinets. I used the original hinges; on the lower cabinets, they are hidden but the upper cabinets show the bronze color. The bronze matched the handles that I picked out. I picked out bright green and bronze for the uppers and just bronze for the lower cabinets. I am so happy with how everything turned out and with how much work got accomplished in such a short time. The kitchen already looks so much brighter and cleaner! This weekend, Todd and I hope to get the kitchen primed. Engagement shoot pictures are supposed to be coming my way tomorrow. I can't wait to show you them too! The cabinets are awesome. I'm a huge fan of craigslist.